The Northwest European population of Bewick’s Swan winters mainly in Britain, the Netherlands and Germany, with smaller numbers in Denmark, Sweden, Belgium and France. The population breeds at high latitudes in Arctic Russia from the Fenno-Russian border east to the Lena Delta. 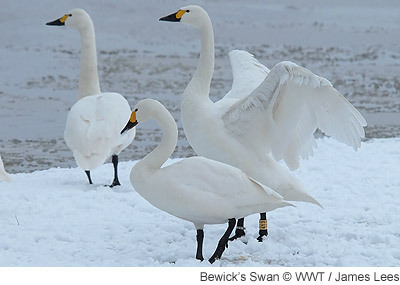 There are also two other populations of Bewick’s Swan: an eastern population which breeds in Arctic Russia to the east of the Lena Delta and winters in Japan, China and Korea; and a much smaller population that winters in the Caspian Sea region. 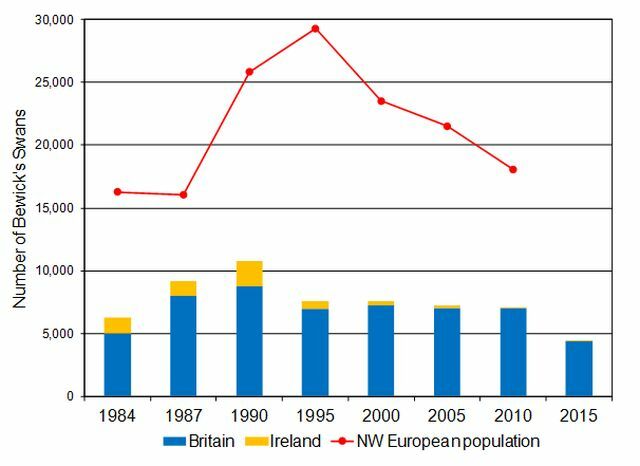 The Northwest European population is a conservation priority, having declined by more than a quarter since the mid 1990s. An AEWA Single Species Action Action Plan was published in 2012 to focus and coordinate conservation efforts. The number of Bewick’s Swans recorded in Britain and Ireland during the International Swan Census, 1984-2010, and the estimate of the size of the Northwest European population (Beekman pers comm; Rees & Beekman 2010). Annual estimates of the percentage of young and mean brood size (young per successful pair) of Bewick’s Swan in Britain (recorded at WWT Welney, the Ouse Washes, Nene Washes, WWT Martin Mere, Ribble Estuary and WWT Slimbridge, where age assessments are made annually), 2003/04-2017/18. Rees, E.C. & J.H. Beekman. 2010. Northwest European Bewick’s Swan: a population in decline. British Birds 103: 640-650. Northwest European Bewick’s Swans breed at high latitudes in Arctic Russia from the Fenno-Russian border east to the Lena Delta. Birds migrate through the Baltic States to winter primarily in the Netherlands and Britain, with smaller numbers regularly occurring in Germany, Denmark, Belgium and France (Beekman et al. 1985, Rees et al. 1997). Ireland used to also support wintering Bewick’s Swans, but they occur infrequently nowadays as a results of a eastwards shift in winter distribution. 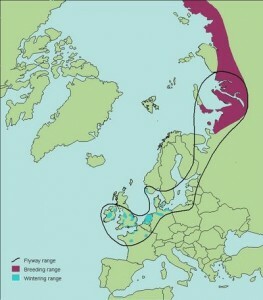 The winter distribution of Bewick’s Swan in Britain is highly localised. It has a southerly distribution with the largest flocks in eastern England, especially at the Nene and Ouse Washes. Smaller flocks occur in western England, and relatively small numbers in Wales. In Britain, Bewick’s Swans winter on shallow freshwater lakes, marshes or slow-moving rivers, near or adjacent to extensive grasslands liable to flooding. Since the early 1970s, they have taken to foraging on agricultural land, especially on waste root crops, grain stubbles and winter cereals. This switch in diet may be attributed to changes in natural habitat quality imposed by land drainage and land claim and to more extensive planting of arable crops influencing feeding site selection by the birds. Generally, Bewick’s Swans in Britain and Ireland switch from arable foods to natural grasses through the winter. Proportionately, however, arable foods remain the most important over the whole winter period. The increased use of agricultural areas in southeast England may result in some conflict with agricultural interests, particularly on re-seeded grasslands and winter cereals. Although this population is protected throughout its range, illegal shooting remains a threat, with 23% of live Bewick’s Swans x-rayed since 2000 found with shotgun pellets embedded in their body tissue (Newth et al. 2011). Shooting has also accounted for the death of 17.3% of dead Bewick’s Swans recovered along their migration route since the 1970s (Newth et al. 2011), and such activity is known to have occurred in the UK (Evans et al. 1973, Brown et al. 1992, Rees & Bowler 2002, Newth et al. 2011). This indicates that illegal shooting remains an issue for Bewick’s Swans, and needs to be addressed at both national and international levels. Beekman, J.H., S. Dirksen & T.H. Slagboom. 1985. Population size and breeding success of Bewick’s Swans wintering in Europe in 1983-4. Wildfowl 36: 5-12. Brown, M.J., E. Linton & E.C. Rees. 1992. Causes of mortality among wild swans in Britain. Wildfowl 43: 70-79. Evans, M.E., N.A. Wood & J. Kear. 1973. Lead shot in Bewick’s Swans. Wildfowl 24: 56-60. Newth, J.L., M.J. Brown & E.C. Rees. 2011. Incidence of embedded shotgun pellets in Bewick’s swans Cygnus columbianus bewickii and whooper swans Cygnus cygnus wintering in the UK. Biological Conservation 144: 1630-1637. Rees, E.C. & J.M. Bowler. 2002. Tundra Swan (Bewick’s Swan) Cygnus columbianus. In: Wernham, C.V., M.P. Toms, J.H. Marchant, J.A. Clark, G.M. Siriwardena & S.R. Baillie (eds.) The Migration Atlas: Movements of the Birds of Britain and Ireland. Pp. 149-153. T. & A.D. Poyser, London. Rees, E.C., J.M. Bowler & J.H. Beekman. 1997. Cygnus columbianus Bewick’s Swan and Whistling Swan. Birds of the Western Palearctic Update 1: 63-74. A coordinated, international census of Bewick’s Swan is undertaken in Britain and Ireland every five years. The census covers many non-wetland and/or temporarily flooded areas that are not routinely covered by other annual schemes. Results from the censuses are presented in various reports and papers. See our Reports & newsletter page. Bewick’s Swan numbers in the UK and Republic of Ireland are monitored annually through the Wetland Bird Survey (WeBS) and the Irish Wetland Bird Survey (I-WeBS), respectively. Although these schemes provide coverage of a high proportion of wintering sites used by Bewick’s Swans, a number of non-wetland or temporally flooded areas are not surveyed, hence a more comprehensive census, that focuses specifically on Bewick’s Swans, is required to estimate total numbers in Britain and Ireland; such a survey is undertaken every five years (see above). The annual breeding success of the Northwest European population of Bewick’s Swan is monitored in Britain through age assessments that are undertaken annually throughout the autumn and early winter. Counters record the number of first winter birds present within a flock and individual brood sizes (i.e. how many young in each family group). Results from these age assessments are presented on the ‘Latest results’ tab, and a summary of annual estimates can also be found on the ‘Status summary’ tab. The abundance of Bewick’s Swans in the UK and the Republic of Ireland in 2017/18 was monitored through the Wetland Bird Survey (WeBS) and the Irish Wetland Bird Survey (I-WeBS), respectively. Results from these schemes are presented in survey reports which are available to download from the schemes’ websites. The 8th census of Bewick’s Swan in Britain and Ireland was undertaken in January 2015 as part of the international census. The census was organised overall by the Wetlands International / IUCN SSC Swan Specialist Group, and coordinated in Britain and Ireland WWT in partnership with BirdWatch Ireland. This census is carried out every five years. The census yielded a total of 4,371 Bewick’s Swans in Britain and 21 in Ireland, which together represent a decline of 38% compared with the Britain and Ireland total in 2010 (Figure 1). This is by far the lowest census total to date. A brief summary of the results was presented in the 2015/16 results for Bewick’s Swan: see the Previous results tab. Figure 1. Number of Bewick’s Swans recorded in Britain and Iceland during the International Swan Census, 1984–2015 (the overall 2015 NW European population estimate has yet to be calculated, with the analysis being undertaken by the Wetlands International / IUCN SSC Swan Specialist group). Bewick’s Swan age assessments were conducted in three regions across England during winter 2017/18 (Table 1). Age assessments were made in all regions in mid-winter (between 14 and 16 January), because a relatively high proportion of early arrivals (i.e. those present in October and November) typically comprise mostly non/failed breeders (Rees et al. 1997), whereas age assessments made in mid-winter can be taken as being more representative of the population as a whole. The percentage of young and mean brood size were derived from age counts conducted within two days in an effort to avoid any bias that would arise from repeated observations of the same families at a particular site. Regional variation in the percentage of young was also assessed in order to determine any differences in the geographical distribution of family parties. A total of 1,198 Bewick’s Swans was aged and brood sizes were recorded for 38 families: 1,068 in east central England, ten in northwest England and 120 in southwest England. No Bewick’s Swans were recorded at Martin Mere/Ribble Estuary during the survey period. Overall, Bewick’s Swan flocks contained 5.7% cygnets which fell below the previous ten-year average recorded at wintering sites in England (11.6% ± 1.3 SE for 2007/08–2016/17). The mean brood size of pairs with young was 1.5 cygnets (Table 1). Table 1: The percentage of young (%) and mean brood size for Bewick’s Swans at sites in Britain during the 2017/18 winter. There was no significant variation in the percentage of young recorded in east central England (5.4%) and southwest England (8.3 %) (Table 1; X21 =1.7, P > 0.05). 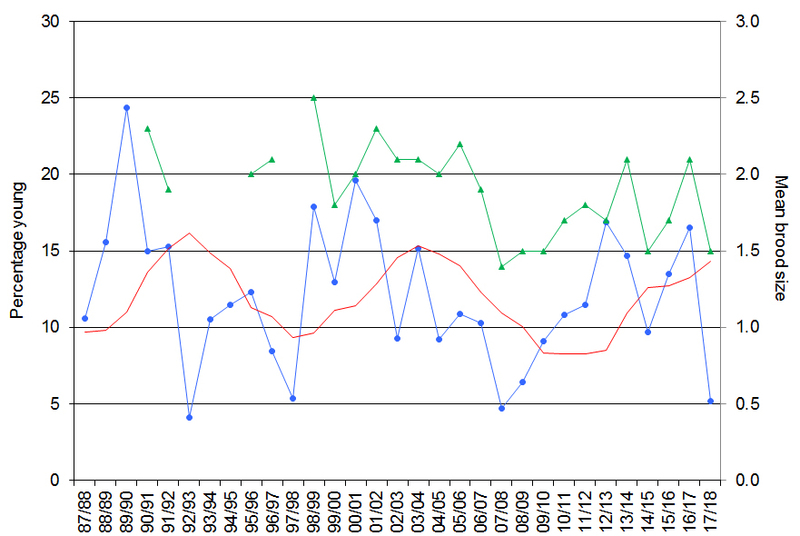 The mean percentage of young in flocks at and around WWT centres (the Ouse/Nene Washes and Slimbridge), where data is collected annually, was 5.2 % (n = 1,144), which also fell well below the previous five-year and ten-year and averages (14.3 % ± 1.3 SE and 11.4 % ± 1.3 SE, respectively) for these sites (Table 1, Figures 2 & 3). The mean brood size of 1.5 cygnets (38 broods) was also below the previous ten-year mean (1.7 ± 0.1 SE). Figure 2: The percentage of young (blue circles), with the rolling five-year mean of percentage young (red line). Mean brood size (green triangles) is for Bewick’s swans recorded at WWT Slimbridge, the Ouse and Nene Washes and WWT Martin Mere/the Ribble Estuary combined, 1995/96–2017/18. Five-year mean values for the percentage of young were calculated for the five years preceding the year in question (e.g. mean presented for 2017/18 is for 2012/13–2016/17). Figure 3. The percentage of young Bewick’s Swans recorded at WWT Slimbridge, the Ouse and Nene Washes, and WWT Martin Mere/Ribble Estuary, 1984/85–2017/18. Overall, Bewick’s swans wintering in the UK had a very poor breeding season in 2017 with just 5.7% young recorded which was below the previous ten-year average (11.6%) for sites in England. The results from an international age count held in December 2017 support these findings. Preliminary results indicate that 8,383 Bewick’s Swans were aged across six countries in northern Europe (including Britain) and, overall, 3.9% young was found amongst the flocks surveyed: compared with 8.2% in 2016 (W. Tijsen and J. Beekman pers. comm.). The mean brood size was 1.61 cygnets (in 109 broods aged): compared with 1.9 cygnets in 2016. Conditions on the breeding grounds are important in determining the population’s breeding success, in particular, weather conditions during the short Arctic breeding season (Poorter 1991). Temperatures in the Pechora Delta (in the vicinity of an important breeding area for the species) in May 2017 averaged -2 °C which was considerably lower than the previous five-year averages for the area (of 3.7°C) (TuTiempo 2017). In the Pechora Delta, where a high concentration of Bewick’s Swans breed every year, the first eggs were known to have hatched in early July (A. Eames pers comm) indicating that the breeding season was delayed by at least three weeks in 2017, most likely due to the harsh conditions encountered in the spring and early summer. Special thanks to all observers who took part in the age counts. Thanks also to Dutch ornithologists Jan Beekman and Wim Tijsen for providing the international data. Poorter, E.P.R. 1991. Bewick’s Swans Cygnus columbianus bewickii, an analysis of breeding success and changing resources. Ministerie van Verkeer en Waterstaat, Rijkswaterstaat, Directie Flevoland. Rees, E.C., J.S. Kirby & A. Gilburn. 1997. Site selection by swans wintering in Britain; the importance of habitat and geographic location. Ibis 139: 337–352. Previous annual results will be archived here. Published results from the International Swan Census can be found on the Reports & newsletter page. Bewick’s Swans have been marked, initially just with metal rings, at WWT Slimbridge since 1961 and until the late 1960s this was the only location in Britain where the species was ringed in any number. During this time the study focused on individual recognition of birds by their unique bill pattern (see WWT’s website for more details). Then in 1967, a regular colour-marking programme was introduced that enabled information to be gathered about the birds whilst on migration, at staging sites and at other wintering sites (Mitchell & Ogilvie 1997, Rees & Bowler 1996). Individual birds could then be monitored throughout their lifetime to determine factors affecting their pairing and breeding successes, survival rates and site selection. This information could be used to explain changes in the swans population size and distribution and enabled researchers to identify their ecological needs (Rees 2006). Such detailed information was and still is invaluable in supporting conservation efforts for Bewick’s Swan, a species that has declined by 27% between 1995 and 2005. At WWT centres, swans are caught in a specially designed ‘swan pipe’ – a long, netted trap which is baited with food to encourage birds to enter, where they can be caught by dropping a gate to close off the entrance. The first swan pipe was built at WWT Slimbridge in 1969 and, following its success, more were built at WWT Welney in 1980 and at WWT Martin Mere in 1990, extending the colour-marking programme to other parts of Britain (Owen et al. 1986, Rees & Bowler 1996). Ringers in the Netherlands started regularly marking Bewick’s Swans in 1985 and more recently birds have been caught and ringed at migratory sites in Germany, Denmark and Estonia and on the breeding grounds in arctic Russia (Rees & Bowler 2002). From 1991 to 2008, WWT joined expeditions with the All-Russian Research Institute for Nature Protection to arctic Russia to study the swans on their breeding grounds. confirmation of the migratory route from the breeding grounds to the wintering grounds: the swans migrate from the breeding grounds along the arctic coast of Russia to the White Sea, head southwest across Karelia to the Gulf of Finland and the Baltic coast, following the northern and southern shores of the Baltic to the wintering grounds in northwest Europe (Rees & Bowler 2002). confirmation that Estonia, the White Sea region and the Pechora Delta are vital staging and breeding areas (Rees & Bowler 2002). evidence that swans wintering in different parts of Britain may have different migratory routes. Swans ringed in northwest England and southwest Scotland (at WWT Martin Mere and WWT Caerlaverock, respectively) have a more northerly distribution than those ringed in southern Britain (at WWT Welney and WWT Slimbridge). Further investigation has shown those birds marked in northwest England are more likely to be reported in Denmark, Germany and Northern Ireland, whilst those ringed in the southwest are more likely to be seen in the Netherlands and other parts of Britain (Rees & Bowler 2002). 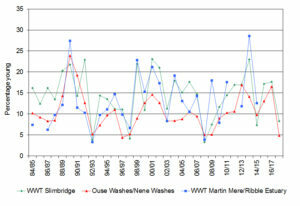 Bewick’s Swans are caught and ringed every winter at WWT Slimbridge and WWT Welney. This is undertaken as part of our long-term life-history study on the species. Each bird is fitted with a coloured leg ring, as well as a metal ring, and various body size measurements and samples are taken to assess its condition and health. By catching these birds we have been able to identify issues affecting them, such as illegal shooting and lead poisoning (Newth et al. 2011, Newth et al. 2012). This information helps to inform subsequent conservation measures taken to reduce the scale of these threats. We work with the All-Russian Research Institute for Nature Protection, the Danish Ministry of the Environment, Komi Science Centre, the Museum and Institute of Zoology at the Polish Academy of Sciences, and the University of Groningen. Mitchell, C. & M. Ogilvie. 1997. Fifty years of wildfowl ringing by the Wildfowl & Wetlands Trust. Wildfowl 47: 240-247. Owen, M., G.L. Atkinson-Willes & D.G. Salmon. 1986. Wildfowl in Great Britain; Second Edition. Cambridge University Press, Cambridge. Rees, E.C. 2006. Bewick’s Swan. T. & A.D. Poyser, London. Rees, E.C. & J.M. Bowler. 1996. Fifty years of swan research and conservation by the Wildfowl & Wetlands Trust. Wildfowl 47: 248-263. Kear, J. 2005. Ducks, geese & swans. Oxford University Press.